Halsey has called out the American Music Awards for the lack of female performers on their nominees list for the 2017 ceremony. The 23-year-old singer is up for a gong in the Collaboration of the Year and Favourite Pop/Rock Song categories due to her tune with The Chainsmokers, Closer. And while she told fans she was delighted with the nod, she was also quick to point out the huge gender gap following the announcement of the nominees. "Really honoured to have received an @AMAs nomination but really disappointed to hear near exclusively male names… such a missed opportunity,” she wrote on Twitter. "So many incredible female artists have released this year. hoping the coming award shows give them the credit that is due to them." While there are female names in the specifically designed female categories, such as Favourite Female Artist - Pop/Rock, the majority of the other categories are lacking any female nominees. In addition, there are no women up for the prestigious Artist of the Year gong. Instead, Bruno Mars, The Chainsmokers, Drake, Kendrick Lamar and Ed Sheeran will all fight it out for that prize. 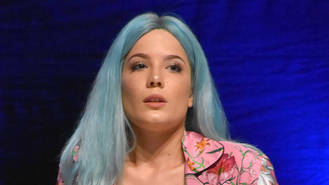 Halsey is the only famous face to comment on the gender gap so far. However, other female performers who received nominations took to social media in the wake of the announcement on Thursday (12Oct17) to express their excitement. Julia Michaels, who is up for the New Artist of the Year gong presented by T-Mobile, tweeted a GIF of her face with the AMA nomination announced behind it, and wrote: "Okay but guys... WHAT IS HAPPENING!!!!! Holy damn moly!" Meanwhile, Lady Gaga, who is nominated in the Favourite Female Artist - Pop/Rock category, tweeted: "Thank u for the nomination! @AMAs." She will have some tough competition taking home the prize though, as she's up against Rihanna and Alessia Cara, who tweeted, "????? how????? wow thank u, @AMAs x" upon hearing the news. The American Music Awards are set to take place on 19 November.